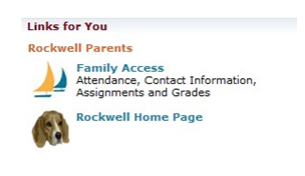 If you need assistance or do not have a Parent Access account, complete the new user process. Click “Family Access" on the right hand side of the page that opens. Select which of your children to view using the drop down menu at the top of the page. The Family and Student Access screen is divided into three portions. The left side of the screen contains hyperlinks that allow you to access the different applications. To view your child’s gradebook, click “Gradebook”.